What Are Rare Clotting Factor Deficiencies? Montreal, QC: World Federation of Hemophilia; 2009. Anwar R, Miloszewski K. Factor XIII Deficiency. British Journal of Haematology. 1999;107:468-484. Muszbek L, Adany R, Mikkola H. Novel Aspects of Blood Coagulation Factor XIII. I. Structure, Distribution, Activation, and Function. Critical Reviews in Clinical Laboratory Sciences. 1996;33(5):357-421. Data on file. Available from CSL Behring as COR DOF-001. Dardik R, Loscalzo J, Inbal A. Factor XIII (FXIII) and Angiogenesis. Journal of Thrombosis and Haemostasis. 2006;4:19-25. Monroe DM, Hoffman, M. What does it take to make the perfect clot? Arterioscler Thromb Vasc Biol. 2006;26:41-48. Acharya S, Coughlin A, Dimichele D, et al. Rare Bleeding Disorder Registry: Deficiencies of Factors II, V, VII, X, XIII, fibrinogen, and dysfibrinogenemias. Journal of Thrombosis and Haemostasis. 2004;2:248-256. Aiyagari V, Testai F. Correction of coagulopathy in warfarin associated cerebral hemorrhage. Current Opinion in Critical Care. 2009;15:87-92. Pandey S, Vyas G. Adverse effects of plasma transfusion. Transfusion. 2012;52:65S-79S. Lovejoy A, Reynolds T, Visich J, et al. 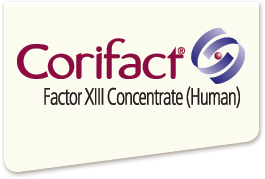 Safety and pharmacokinetics of recombinant factor XIII-A2 administration in patients with congenital factor XIII deficiency. Blood. 2006;108:57-62. MASAC recommendations concerning products licensed for the treatment of hemophilia and other bleeding disorders. National Hemophilia Foundation (NHF) Web site. http://www.hemophilia.org/NHFWeb/MainPgs/MainNHF.aspx?menuid=57&contentid=693 . Accessed April 4, 2018. Factor XIII. National Hemophilia Foundation (NHF) Web site. https://www.hemophilia.org/Bleeding-Disorders/Types-of-Bleeding-Disorders/Other-Factor-Deficiencies/Factor-XIII. Accessed April 4, 2018.